Bentley is today announcing full details of the world’s first luxury hybrid model. 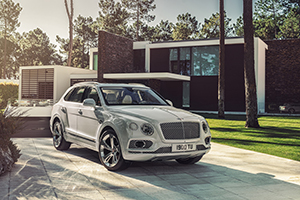 The Bentayga Hybrid represents Bentley’s first step towards full electrification, combining the serenity of silent motoring with exquisite comfort and effortless performance. A number of Hybrid-specific functions will also be introduced to the latest Connected Car ‘MyBentley3’ services, including Remote Battery Charging, Remote Heating & Cooling, and Vehicle Status Report, operated via a smartphone app. Other unique features include Charging Station Finder, where the app will list nearby or relevant charging stations (based on your search criteria), and give you the option to set them as destinations on the car navigation system; and My Cabin Comfort which allows you to set the car to heat (or cool) itself so that the cabin is at the optimum temperature when the door is opened.